Contrary to the claims of big business lobbies, many small business owners support raising the minimum wage. Not only is it the right thing to do, it’s a key step toward economic recovery. Every extra dollar in the pockets of low wage workers will get pumped right back into the economy, so everybody wins. Produced by Telequest, Inc of Princeton NJ for the NJ Main Street Alliance (a project of NJ Citizen Action). The goal is to inform voters that they can raise the minimum wage in NJ on November 5, 2013 by voting YES on ballot question #2. 100,000 ADDITIONAL SQUARE FEET of retail space is equal to one hundred (100) 1,000 square foot “shoppes” in Old Town or fifty (50) 2,000 square foot “shoppes” in Old Town, Fortuna, Arcata, Cutten, or even twenty-five (25) 4,000 square foot “emporiums” in the Henderloin or anywhere else in Humboldt County. These retail spaces will become redundant. Surplus. Vacant. Or maybe you think we have too many shoppes and emporia in Eureka, Arcata, Fortuna, Garberville, and elsewhere in Humboldt County? The theory behind the tiered minimum wage (and here we refer to a two tiered minimum wage, increased only for larger employers, not for smaller employers) is clear. Many recent studies have shown that the majority of minimum wage workers work for very large businesses with adequate financial resources to pay a high minimum wage of $12.00 to $15.00 an hour. We are in an era of extraordinarily high corporate profits, and it coincides with an era when workers are getting the smallest percentage in wages of the value of the product of their labor in a half century. We call the large employers the formal economy. Smaller businesses, that we call the informal economy, are family & friends businesses for the most part. When we talk about raising the minimum wage it is important to remember that it is not only small business owners who resist raising the minimum wage, but it is often employees of these small businesses who also oppose us. Both of them are fearful of business failure and loss of employment. This is the practice part. It is our experience that this fear cannot be overcome. Thus we in the minimum wage movement must honor this informal economy (both the business people and the employees) and give exemption to smaller businesses in minimum wage laws and ordinances. Yes it is a compromise, but there are a certain number of people who want and enjoy flexibility in their work arrangements and alternative wage arrangements and find them in the informal small business context. This is a historic compromise between the idea of government regulation of business and deregulation. In this case, large businesses are regulated, while small businesses are deregulated. 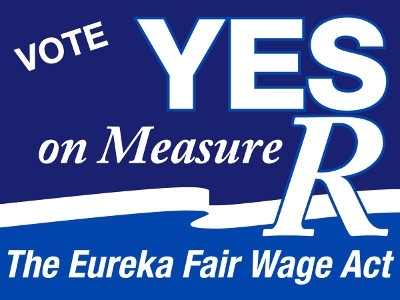 With this understanding we then need to ask “What is a small business?” When we started our dialog here in Eureka at the beginning of the Eureka Fair Wage Act campaign our initial figure was 100 employees. Through discussion with fellow activists and other community groups including organised labor our figure was soon reduced to 25 employees. It seemed to stick there. And now that we are out in the community it is a figure that seems to raise very little controversy. The number 25 employees or more seems to resonate with the public as a reasonable distinction between a small business and a large business. So if there is a sweet spot, a Goldilocks number, a magic number for two tiered minimum wage proposals, it is likely somewhere between 20 and 50. It is interesting that Santa Fe New Mexico, with its increased minimum wage, has an exemption for less than 25 employees as well. We arrived at that same number through independent means. It has been very easy to get signatures in support of the two-tiered minimum wage. We are almost certain we will make the ballot with it. By going to a two-tier minimum wage we have assuaged a good portion of the concern from the small business community. 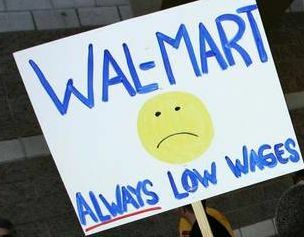 Indeed, many of them start to see higher wages for large enterprises as a benefit for smaller local businesses. This is a wedge issue, but it is the people’s wedge issue.